info: Voting for nominees will continue through July 7, 2009. The top 77 nominees by group categories (the top 11 in each of the seven groups) will be eligible for consideration by the New7Wonders of Nature Panel of Experts, under the leadership of Prof. Federico Mayor, former Director-General of UNESCO. The Panel of Experts will review these 77 nominees and choose from them the 21 Official Finalists, according to published criteria. The selection will be announced on 21 July 2009, and the 21 Official Finalists will then enter the third and final phase to vote and choose the Official New7Wonders of Nature. International Coordinating Council of the Man and the Biosphere Programme (MAB-ICC) just added 22 new sites from 17 countries to the UNESCO's World Network of Biosphere Reserves (WNBR) which now counts 553 sites in 107 countries. One of the new reserves is in South Africa. According to FIFA some 383 506 tickets, or 63 percent of the total 640 000 tickets available, had been sold by 21 May. Category four tickets are the cheapest tickets and are available exclusively to South African residents in Rands. For the group matches and the third place match, category four tickets go for R70 only. Categories one to three tickets are available in foreign currency to football fans living outside the country. Category one tickets are for seats alongside the pitch, between the goal lines. Categories three and four tickets are for seats behind the goals or in the corners. Deals to keep you warm & cosy this winter! 1. Book two nights accommodation with us & get the third night absolutely FREE! 2. Book 6 nights accommodation, get the third & the sixth night free. As an ADDED EXTRA.. you get a choice of either a free round of golf at Kingswood Golf Estate valued at R400, or a free cheese & wine tasting tour! These specials are valid from 26 May 2009 - 31 July 2009 and are subject to availability. Kumuka Worldwide have recently made some changes to their tour pricing to comply with ACCC legislation in Australia which comes into effect on the 25th of May 2009. The changes will mean that Kumuka will no longer have separate tour funds and local payments and in effect they have now been merged into one single tour price. Due to currency considerations the total price in some cases may be higher than the tour price and local payment added together. The Kumuka website has been updated with the new prices and will now apply to all new bookings. Overland Tours - special offers! Argentina, Buenos Aires, Chile, Santiago, Bolivia, Salar de Uyuni Salt Flats, Lake Titicaca, Cuzco, Inca Trail, Machu Picchu, Colca Canyon, Nazca Lines. La Paz, Bolivia, Peru, Lake Titicaca, Inca Trail, Machu Picchu, Colca Canyon, Nazca. Aegean Sea, Santorini, Cyclades Islands, Mykonos. The thrill of watching animals in the wild has gained widespread popularity, especially in the tourism industry. Inspired by programmes like Planet Earth, many people set out to discover their ‘inner Attenborough’. Our resident Zoologist Holly Foat looks at the impact this may have on wildlife and provides tips on how to watch wildlife the responsible way. Watching wildlife the responsible wayThere is arguably nothing more exciting in life that watching a whale breach in front of your boat or watching a bear hunting in its natural habitat but there is often concern associated with wildlife tourism. Sometimes the animals or the environment can suffer from increasing tourist numbers, habituation and disturbance. However, if wildlife watching is well managed then the animals and the environment can benefit from both the increase in awareness and education among the tourists and the extra finance for conservation projects. There is an amazing array of trips for you to experience the awe inspiring wildlife of the world. These include tracking the endangered tiger, watching whales and dolphins at various locations around the world, Gorilla safaris, polar, grizzly and brown bear watching and a huge number of conservation projects involving big cats, orang-utans, fossa and many others! Many areas will have a code of conduct in place to protect the species you will be watching. For example, whale and dolphin watching boat trips will have a set distance which they should keep and will not be able to chase or follow the animals. Australia has government guidelines for whale and dolphin watching, Scotland has a dolphin space programme and Wales has the boat users’ code of conduct. If you believe a trip is disturbing the animals, let the operators know your concern. Some wildlife watching operations use bait to lure the animals to where the tourists are. This can be detrimental to some species, especially predatory species such as shark and monitor lizards that learn to associate humans with food. But others species will benefit from supplementary feeding if it is suited to their diet as long as they don’t become dependent on it. The key to a good wildlife watching trip is education. Every trip should give the tourist a talk or pamphlet about the ecology and conservation of the species. Ideally they should also be involved in further research or funding of conservation projects. Wrap up warm! If you’re on a boat or hillside it’s likely to get cold. Even in a hide it can get cold, especially when your sat waiting and not moving. So wear layers of clothing that you can put on or take off depending on the temperature. Take a camera, binoculars and lots of spare memory cards or film but try to avoid using your flash. If you’re on foot, don’t stray from marked paths and trails. Don’t wear perfume or smoke and try to be as still and as quiet as possible so not to disturb the animals. Try to avoid clothing that rustles or anything with noisy Velcro. Don’t take your dog with you as they tend to bark at unfamiliar animals. Keep a safe distance from wild animals. Disturbed animals have a tendency to become unpredictable and may attack if they feel threatened. Check out the RSPB’s bird watching code. Patience is a virtue and you will need plenty of it if you want to see something special. Appreciate what you do see. Wildlife sightings are not guaranteed so you might not see that big emotive animal that you were hoping to, but don’t be disappointed, just enjoy what you do see. The chances are that you will see several other animals that you wouldn’t see at home which are equally as exciting but less publicised. According to a German report Volkswagen South Africa will stop producing the popular VW Citi Golf, also known as Golf 1, in the coming months to make way to concentrate on the new Polo and Jetta production from 2010. "After nearly 32 years, Citi is clearly nearing the end of its life cycle," the report quotes VWSA boss David Powels. Volkswagen is reported to be investing R3.5-billion in preparing the Uitenhage (close to PE, production site of VWSA) works in preparation for a new Polo and Jetta export deal (left-hand traffic markets) and that will require Citi to end production to make way for the new line. I just read on twitter that BazBus is increasing their rates by 01 July 2009. Purchase your tickets now before the price increase and travel when you are ready. Tourists are urged to be aware that there will be a major game capture operation taking place between Monday the 25th and Friday, the 29th of May 2009 at Mokala National Park. The Matopi Loop, located in the western side of the park, will be closed during that time due to the extreme dangerous and sensitive nature of the capture process. Table Mountain Aerial Cableway and the City Sightseeing Bus Company have partnered for the first time to offer the same exciting winter special to families – two kids ride the bus and the Cableway for free if accompanied by a full-paying adult. MORE info tba soon! The perfect family safari! Tour Tanzania’s game parks in search of the "Big 5," experience breathtaking views of East Africa's Great Rift Valley, and relax each evening in safe, comfortable lodges — an unforgettable adventure. Arrivals from Australasia, Central and South America, and the Middle East, all recorded relatively strong growth rates. Within Europe, tourist arrivals from the UK (which accounted for over 34% of all European arrivals) fell 2.5% y-o-y, while German visitors declined a sizeable 6.5% y-o-y, and visitors from France were up a strong 11.2% y-o-y (after growth of almost 9% y-o-y in 2007). Looking at data for the month of December 2008 however, apart for Central and South America, Middle East and Africa, all the other regions recorded negative y-o-y growth in arrivals. Indeed, the number of visitors from Europe was down over 5% compared with the same month in 2007. According to news24 and IOL at least 4 backpackers died today in a fire that broke out at "Two Oceans Backpackers" on Longstreet. Seven more guest were injured and are in hospital right now, 4 of them in serious condition. The fire broke out around 5am, Superintendent Andre Traut told the media. Will keep you updated as soon as more info are available! update: The building was completely destroyed in the fire, the cause of which was still unclear at the the moment. update: Loop Street is closed at Strand Street. Waterkant is closed at Long and Bree streets. update: News24: "Meanwhile, locals said the Two Oceans backpackers acted more as a permanent hostel than temporary accommodation for tourists. The owners of the backpackers were facing eviction as their lease was drawing to an end." update: The Times: "Police had raided the premises on several occasions, and made arrests for robbery, theft and drug-related charges. "That building is not unfamiliar to the SAPS in Cape Town," he said." British & Irish Lions Tour to South Africa 2009 - accommodation update! The British & Irish Lions return in the European summer of 2009 ( 30 May - 04 July) for a tour of newly crowned World Champions, South Africa. The Lions had a torrid time in New Zealand in 2005 and will be looking to emulate the South Africa tour victories of 1997. Don’t miss a second of the action, get your British Lions tickets now! Pre Packaged Self Drive British & Irish Lions Tours (with match tickets) are also available! Training complies with all the standards set out by the Guiding Association of South Africa and is led by renowned trainers. Subjects covered include: Ecology, Botany and Taxonomy as well as Tracking, Identification, Weapons Handling and Bush Driving. The course is structured to maximise the practical experience of students in the bush. Each day allows for hours of time spent in the field interpreting the ecology and enjoying a wildlife experience in South Africa's beautiful wilderness. It is hoped that these courses on their own, or combined with a expedition allow a greater understanding and involvement of our world's habitats. Our base is a Wilderness Camp, situated in a true wilderness area in the Kruger National Park. The entry point is Numbi Gate and the wilderness area stretches to the southern Malelane area. This course provides wildlife enthusiasts with a thorough insight and introduction in the world of field guiding. If you are looking for a career that will be an adventure, or a hands-on experience in the bush that you will never forget, this course is for you. This is a 6 month course which is the ideal platform for a successful career in the African game lodge industry. Over the years, field guiding has become more specialised and sophisticated. It has become a career, which is increasingly viable in larger areas of Southern Africa as tourism continues to grow, but also one which demands dedication and education. South Africa.... Thrills of Nature... from Lance on Vimeo. Rio de Janeiro, Paraty, Iguassu Falls, Buenos Aires, Bariloche, Puerto Varas, Santiago. Journey across 3 countries through the heart of South America. Sip wines in Santiago, learn to tango in Buenos Aires and live it up in beachside Rio. Experience diverse landscapes, from majestic mountain peaks to roaring waterfalls, including the greatest of them all, breathtaking Iguassu Falls. Bangkok, Siem Reap, Angkor Wat Temple complex, Phnom Penh, Sinhanoukville, Mekong Delta, Ho Chi Minh City (Saigon), Nha Trang, Hoi An, Hue, Halong Bay, Hanoi. The scenic beauty coupled with the diverse legacies of their past make Cambodia and Vietnam truly fascinating. Marvel at the ancient temples of Angkor, face the horrific reality of the Killing Fields, relax on white sandy beaches, brave Saigon and Hanoi's chaotic streets, soak up the relaxed pace of life in Hoi An and Hue, and discover an incredible corner of Indochina that you will never forget. With three world class cities to explore, stunning beaches, cool hill stations, colourful and fun bazaars and all the spicy, yet delicious, street food you can handle, this journey gives you a great insight to a unique and diverse part of the world. Take an amazing overland journey across the roof of the world. From the frenzied streets of Beijing travel the high-altitude railway to charming Lhasa and overland to Kathmandu via the great monastic centers of Central Tibet and Everest Base Camp. Take part in temple rituals and haggle for a bargain in the markets. From the hectic streets of Bangkok to the tranquil charm of Luang Prabang, and the timelessness of Vientiane, this is a memorable introduction to a land that is a treasure trove of history and culture. Experience this wondrous journey of an unforgettable area. SA Express Airways will launch daily flights to Maun, Botswana, from July 1 2009. TAP has marked the creation of new rules recently regarding the transport of sports equipment for surfers with a special campaign available throughout the month of May and one which is reflected in the offer of free transport for the surfboards of those who practice this sport. Thus, passengers simply need to request this when booking or with the most advance warning possible prior to the start of their trip, confirming equipment to be transported and supplying information on the number of bags, their total weight and respective dimensions. Surfboards must be properly packaged and transported in an appropriate bag for one or more boards and weigh up to 10kg. This special offer is only valid on flights operated by TAP and includes one baggage piece per passenger who must fill out the term of responsibility for transporting surfboards when checking in. Transport authorization is subject to space limitations on board some aircraft. Making the most of the opportunity offered by the excellent existing conditions in Portugal for surfing allied to the fact these new rules turn the company into "the best friend of the traveling surfer", TAP is striving to meet the expectations of those who practice this sport by offering them now this unique special offer too. What to do? Go to Kumuka Worldwide Special Offers Page, check which tours (I think it is almost all of them) are getting discounted by Kumuka & book before the 15 May 2009. Easypeasy! The Otter trail is undoubtedly the best known and most popular of the South African hiking trails and can only be described as Magnificent. This trail followings the Tsitsikamma cost line and is ranked alongside the best trails in the world. The trail takes us past majestic waterfalls, caves, virgin forests, natural rock pools, rivers, pebbled coves, cozy cabins and views you will remember for the rest of your life. OH! And best of all, there are loos with a view J. The trail requires a good degree of fitness as there are some steep sections, which together with a backpack can become tiring, especially after a few hours of hiking. One must be prepared to hike up to 13 kilometers a day, over rough terrain and steep ascents and descents. · First and last night: Forest Huts at the Storms River Rest Camp. Huts accommodates 2 people. Each has one bedroom with two single beds, communal ablutions, communal kitchen and utensils. Emirates has increased all weight based checked baggage allowances by 10 kgs, meaning they now have one of the world’s most generous baggage policies. Economy Class customers can now check in 30 kgs, Business Class travellers may take 40 kgs and if you are flying First Class you can travel with 50 kgs of checked baggage. The global economic crisis has created a new wave of potential volunteers. Al Jazeera reports about a eco/volunteer project in Malaysia quoting the study "Volunteer Insights 2009" I have blogged about earlier today. How to avoid illnesses caused by unsafe food and drink and what to do if you get diarrhoea. 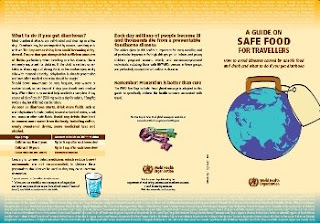 Well, the pamphlet by the World Health Organisation (WHO) didn't give me any new info about what to eat or better what not to eat when travelling around. It is somehow a more detailed version of "cook it, peal it or forget it". Ever thaught about volunteering? Or combining your travels abroad with some volunteering? Well, the study (pdf file) had the goal to obtain a snapshot of consumer attitudes globally towards volunteer travel, the motivations behind taking a volunteer vacation, the expectations, as well as the reason for choosing not to volunteer abroad. Very good read! Mpumalanga, Blyde River Canyon, Bourkes Luck Potholes, Manyeleti Game Reserve, Kruger National Park, Milwane Game Reserve, Durban, Pretoria, Maputo. Track down the "Big 5" in Kruger National Park, enjoy the beaches and feel the latin buzz of Mozambique, and participate in some great outdoor and cultural activities in Swaziland on this diverse and fantastic adventure which embodies of what southern Africa has to offer! After being in place for only a year, the flight tax imposed by the Dutch government has been scrapped, officials in the Netherlands announced. The Dutch government has decided to scrap the flight tax from July 2009 onwards. The abolition of the flight tax is one of the measures by the Dutch government to stimulate the country’s economy during the difficult times the world is currently struggeling with. The flight tax was introduced on July 1 last year for all passengers who left Holland from a domestic airport - short-haul flights was €11.25, while long-haul passengers were charged €45. Swine Flu Map - Africa still not affected!